NASA reveals new details about the Bennus asteroid. 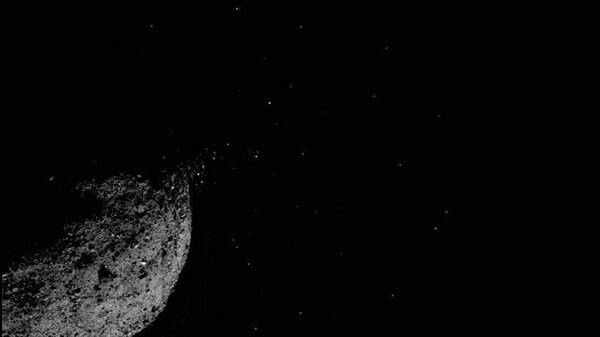 NASA's first asteroid-sampling mission OSIRIS-REx has found out that particles plumes are erupting from the surface of asteroid Bennu. It is an asteroid that is the size of the pyramid of Giza. The Origins, Spectral Interpretation, Resource Identification, Security-Regolith Explorer (OSIRIS-REx) spacecraft, observed the particle plumes in January, followed by additional particle plumes over the following two months. While some of the particles were slow-moving, others were observed to be orbiting around the asteroid similar to small satellites. Bennu's entire surface was discovered to be rough and dense with boulders, which contradicts the Earth-based observations that showed a smooth surface with a few large boulders. Moreover, the team observed a change in the spin rate of Bennu as a result of the Yarkovsky-O'Keefe-Radzievskii-Paddack (YORP) effect. The change in the spin rate is caused due to uneven heating and cooling of the asteroid as it rotates in sunlight. OSIRIS-REx took flight in 2016 with a mission to explore Bennu, the smallest body ever orbited by a spacecraft. The spacecraft is said to return back to Earth in 2023. The data sent back to Earth will help astronomers learn more about the origins of the solar system, and improve their understanding of asteroids.